What it is: A trio of value-priced resorts that differ mostly in decor instead of design. Each has multiple themed buildings, and all rooms are within walking distance to the main lobby. Rooms are standard with minimal decor, though each building is plastered in large-scale theming. Great for: Families and groups of friends who will be maximizing their time in the parks and don’t mind where they stay, as well as park guests who prefer spending money on park experiences rather than lodging. Avoid if: Your ideal Walt Disney World hotel room is inside Cinderella’s castle. Sure, there's Disney decor across the property, but it’s more colorful and in-your-face than classic or artistic. Don’t miss: The other two All-Star resorts! It’s easy to walk between the trio, and the varied larger-than-life decor may very well be a fun attraction for your group. Pro tip: All three resorts share a Disney Transportation bus at off-peak times, during which the pick-up and drop-off order is Sports, Music, and Movies. If theming does not matter to you, consider opting for All Star Sports because of this. What it is: The newest (and nicest) of Walt Disney World’s value-priced hotels. Here, you get what you pay for—including suites themed to popular movies and exclusive access to the Blue Pool: a Finding Nemo water wonderland complete with underwater speakers. Great for: Young children who have taken to Disney animated classics, as well as tweens who can’t get off their phones. Detailed, large-scale decor truly makes it feel like you’re walking in movies like The Lion King or The Little Mermaid while heading to the gallery-like lobby each morning. Little kids will be in awe of the Cozy Cone Pool, which boasts immersive aspects that rival Cars Land in Disney’s California Adventure. Older children will have more than enough to Snapchat while they’re away from home. Avoid if: You wouldn’t utilize three beds. Although listed as a value hotel, Art of Animation’ large-occupancy rooms can cost as much as moderate and deluxe-priced properties, depending on the day. Don’t miss: Landscape of Flavors, the popular food court that serves Tandoori meats, Mongolian grilled fish, and other global dishes rarely found at quick-service— let alone hotel resorts. Pro tip: If you see something you like at the Ink And Paint gift shop, grab it. They carry a wide range of movie-themed toys and souvenirs that can be tricky to find elsewhere. What it is: A living time capsule by way of a value-priced hotel that pays homage to the decades of the 50s through 90s, with stories-high sculptures of laptops, 8-track players, and Walkmans. Great for: Adults traveling together who want to spend a majority of their time in the parks, and grandparents who are nostalgic for the good ol’ days of Disney and grew up with Snow White rather than Aladdin. Avoid if: Your young children are excited to visit Walt Disney World. Seriously. Although the resort is only 12 years old, it can feel terribly dated because of its theming, and small children won't likely appreciate the tech throwbacks. Don’t miss: The lobby’s shadow boxes are filled with incredible vintage artifacts, trinkets, and clothing from decades past. Pay close attention to the 70s—there are vintage photographs and souvenirs from the early days of Walt Disney World added into the mix. Pro Tip: The Everything POP food court sells a tie-dyed cheesecake that cannot be found anywhere else on Walt Disney World property. Other highlights include The Picnic Burger (pickles, sauerkraut, and an entire grilled hot dog) and the Oscar burger: a jumbo lump crab and brie-topped delicacy. What it is: A massive expanse of moderate-priced lodging with greenery and small man-made beaches. Inside, you'll find six themed villages all surrounding Biscayne Bay. Great for: Anyone who secretly wanted to spend their vacation on a relaxing beach trip rather than at Walt Disney World, as it truly feels like a Caribbean getaway. Avoid if: You have young children who require a stroller or have anyone traveling with you who cannot walk easily. Caribbean Beach Resort is one of Disney's most spread-out, mid-level hotels, with everything from the front desk to your room and the dining area in separate buildings. They do operate an internal bus system, but it can be time-consuming. Don’t miss: The Spanish-themed pool, which has two slides, spas, and is perfectly entertaining for any member of the group who doesn't want to visit a park. Pro Tip: Be absolutely sure to check the hotel layout before giving your room preferences, as it could significantly affect your transportation time in the mornings and evenings. What it is: A moderately-priced hotel with flourishes of Colonial Mexican decor and three different themed villages surrounding a scenic lake. Great for: Couples celebrating an anniversary, adults traveling together, and groups of friends on vacation. Because it sometimes operates as a convention center hotel, Coronado Springs tends to be a bit more upscale than other mid-level properties. Avoid if: You want to be fully immersed in a Disney-themed experience. There is practically nothing character-centric for children to enjoy here. Don’t miss: The hot tub at the Dig Site. It happens to be Disney’s largest—12 guests can soak comfortably—and it sits near a massive waterfall built within a replica of Mayan ruins. Pro Tip: If you want a southwestern desert feel, request a Rancho room; for more of a beach vacation experience, note your preference for the Cabanas instead. What it is: A waterfront resort with winding staircases and large-scale hotel buildings designed to look like sweeping Southern mansions. Also home to: Disney’s Port Orleans Resort, French Quarter. While the moderate-priced properties are not connected and cannot be seen from one another, they are technically close enough to walk between. Great for: Young children who are completely princess-obsessed. 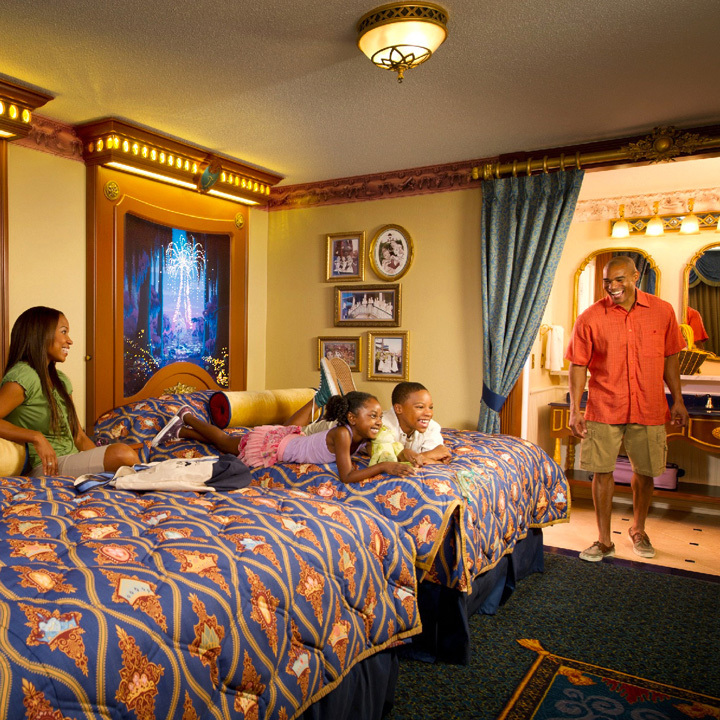 The Royal Guest Rooms come with light-enhanced fireworks headboards, genie bottle faucets, and fairytale touches throughout. Though the price point is average, the property appears far more high-end simply because of its gilded theming. Avoid if: Someone in your property cannot walk long distances, you will not be checking in until after sundown, or you are (be honest) a person who easily gets lost. Port Orleans Riverside is hands-down the most confusing resort to navigate, and doing so at night is nearly impossible. The rooms wind around through various corridors and the bus stops are difficult to differentiate, so unless you are planning a morning arrival and don’t mind taking a short hike to your room, skip it. Don’t miss: A casual walk on the main pathway through the lush property, or a leisurely ferry ride down the Sassagoula River. Pro tip: Horse-drawn carriage rides and surrey bike rentals are available for taking in more of the riverfront. Looking for something that the kids will enjoy? Don’t miss Yeeha Bob’s wild nighttime performances at the River Roost. What it is: A quaint, city-like property that will make you feel like you’re staying right on Bourbon Street—only without the boisterous parties. Great for: People who dislike larger hotel properties, like Port Orleans Riverside. The sister property is large enough to host multiple Disney Transportation bus stops, but French Quarter is not, making it easier to get to the parks in the morning. Also ideal for people who love city vacations. Avoid if: You want your Walt Disney World trip to seem more like a vacation retreat. While the decor is lovely, the theming effectively makes the property seem as though it's in downtown New Orleans. Don’t miss: Mickey Beignets! The only place you can find these iconic donuts while visiting Disney World is at Sassagoula Floatworks and Food Factory (the Mardi Gras-themed food court inside the hotel). Pro Tip: The Doubloon Lagoon isn’t lacking in any way (it even has a 51-foot-long sea serpent slide), but guests of both Port Orleans hotels have access to both property's pools. What it is: A high-end hotel in the style of the Pacific Northwest that utilizes waterfalls and rock structures to evoke a quaint mountain town chalet. Also home to: The Villas at Disney’s Wilderness Lodge, a DVC property nextdoor. Great for: Travelers who hate wasting time. So many hotels on Disney property are wildly spread out, forcing guests to walk great distances just to catch the bus. The Wilderness Lodge, on the other hand, is modest in size, meaning there's only a short walk between dining, ferry pick-up, transportation, pools, and your room. Avoid if: You’re looking for a resort jam-packed with activities. While the Wilderness Lodge exudes rustic charm, there's not much to do beyond relaxing and exploring the scenic property. Don’t miss: The eruption of the life-like Fire Rock Geyser, which explodes every half hour. Pro Tip: If it’s your first time dining at Whispering Canyon Cafe—and you like surprises—be sure to ask for ketchup or a drink refill. What it is: A gorgeous, African safari-inspired deluxe hotel with multiple dining destinations and hotel rooms that look out over the savannah. Also home to: Jambo House and Kidani Village, Disney Vacation Club properties offering top-level views and expanded rooms. Great for: Everyone, really, but it’s an especially smart choice for couples on vacation and families looking to stay in a hotel that’s as exciting as the parks themselves. Staying this close to the wildlife preserve feels like you’re actually spending a night on safari. Avoid if: Your schedule is jam-packed. If you’ll be returning late at night and don’t have at least half a day to wander through the property and enjoy the 30 animal species (giraffes, bongos, wildebeest) roaming the grounds, it simply won’t be worth the hefty price tag. Don’t miss: The scenic Victoria Falls Lounge below the lobby and the flamingos just an arm's length away on the far side of the Uzima Pool. Pro Tip: Dine at Animal Kingdom Lodge's Sanaa for lunch, as the animals are more active and visible at mid-day. While there, don’t miss the Indian-style bread service: it’s one of the best dishes on Disney property. What it is: Two interconnected, upscale resorts evoking old school New England with a location that can’t be beat and the undisputed best hotel pool on Disney World grounds. Also home to: Beach Club Villas, a Disney Vacation Club (also known as DVC) resort onsite. Great for: Convenience-obsessed families (or anyone who despises sitting on a bus). Both hotels are a very short walk to Epcot’s World Showcase and a quick boat ride or walk to Disney’s Hollywood Studio, and both have access to Stormalong Bay: a small on-property water park that contains a pirate slide, sand-bottom pool, and lazy river. Avoid if: You are traveling with young children. The theming of the hotel skews older, and their age may prohibit your family from fully enjoying the pool facilities. Don’t miss: Beaches & Cream, the greatest ice cream parlor at Walt Disney World. Order the massive Kitchen Sink, if you dare, which is topped with an entire can of whipped cream. Pro Tip: If both hotels are priced similarly, book Beach Club instead. Yacht Club is a few paces further from Epcot.